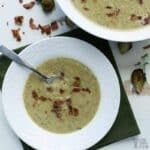 An easy roasted Brussels sprout soup with bacon is a comforting way to eat a serving of vegetables. 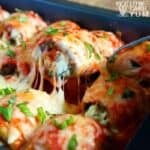 It makes a great appetizer to dinner or can be enjoyed as a light lunch. One of my favorite low carb vegetables is Brussels sprouts. However, I typically only cook them over the holidays pan fried with bacon and cranberries. It’s always a special side dish that I look forward to making after I make a batch of sugar free dried cranberries sweetened with stevia. But, these tasty little veggies caught my eye on a recent trip to Whole Foods Market. So, I picked some up to make this roasted Brussels sprout soup with bacon. Although roasting the vegetable make a wonderful side dish for dinner, I thought I’d try something different. However, I still wanted to combine it with bacon. I actually had some pre-cooked bacon in the refrigerator so I used that. Since it didn’t have the full flavor infused in the soup, I tested another batch cooking the bacon in the soup pot. Of course, starting out cooking the onion in bacon grease and browned bits resulted in a much better flavor. So, I changed the recipe to use raw bacon versus pre-cooked. The recipe can still be made with pre-cooked bacon. But, if you want the full flavor of the bacon to come through, it’s much better to start off with raw bacon cooked in the soup pot. I originally though though of keeping the Brussels sprouts halved in the soup. But, St. Patrick’s Day was only a few days away so I thought it would give a festive green color if they were pureed. 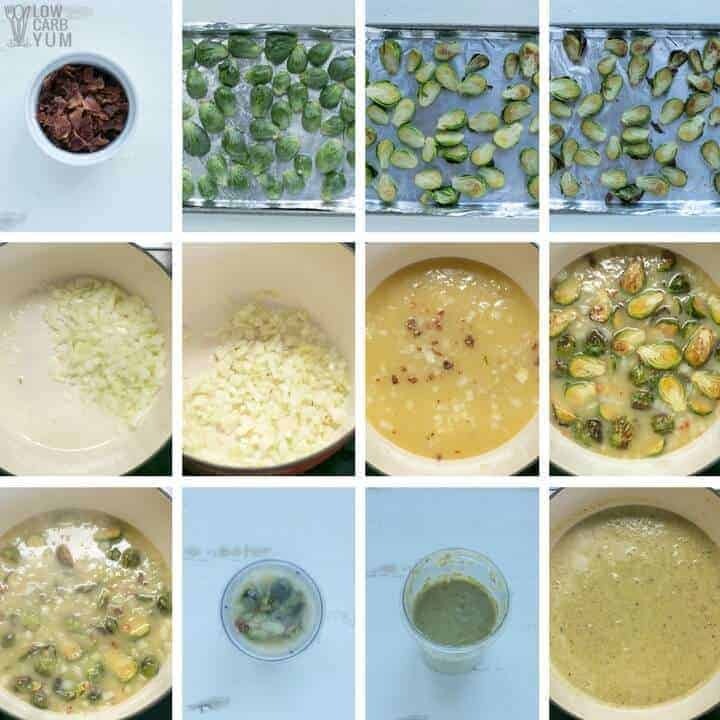 So I decided to run the roasted Brussels sprout soup with bacon through a blender. 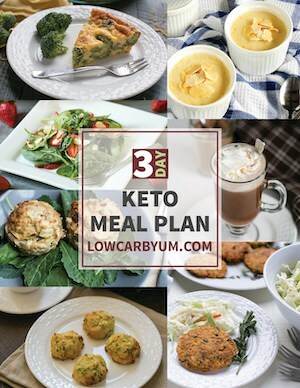 And, I’m really glad I did that because it made a thick low carb soup that was easier to eat. The green color was also perfect for the upcoming Irish holiday. Although, I’ll admit that there wasn’t any left when the day arrived as it was so delicious it didn’t last long in the refrigerator. It’s been unseasonably cold here in Connecticut as well. So the soup really hit the spot during the snowstorm we had this week that dumped about 18 inches of snow in our area. When the groundhog saw his shadow this year, I was bummed as I was hoping spring would come earlier. But, with the official start of spring only a couple days away, it’s looking like the groundhog was right. If I can still get Brussels sprouts during the warmer weather, I’ll make this recipe again. I really love the flavor and could eat it year round. 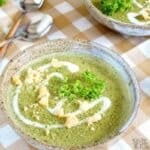 Some of the other low carb soup recipes that I love are my Broccoli Cauliflower Cheese Soup, Zuppa Toscana, and Sausage Kale Soup. And, the taco soup has become my most popular Instant Pot recipe. Soup has become a popular dish at our family gatherings. So, I may make a double batch of this roasted Brussels sprout soup with bacon recipe to see if it goes over well. 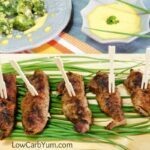 Since my pan fried Brussels sprout dish is enjoyed by my family during the holidays, I think this low carb recipe will be a hit too. 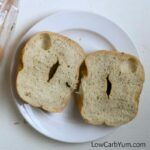 And, since the vegetable is hidden, I may see if they can guess what it is. One of the things I love about serving soup is that I just keep it in the slow cooker or electric pressure cooker on the warm setting. So the dish stays warm for hours without worry. That’s why many times, I’ll just do a large batch of no bean chili or turkey pumpkin chili in the slow cooker. My oldest daughter will be turning 21 years old in a couple weeks. Since it’s a milestone birthday, I’ll invite the family over to celebrate. I may put this soup on the menu. I haven’t made my low carb bacon cheeseburger casserole in a while. So, maybe I’ll add that one in to the menu as well. However, my daughter has moved to a dairy-free diet so it may not be the best choice. I’ve been staying away from dairy as well. So, perhaps my oven baked bacon wrapped chicken tenders would be a better recipe to make. And, my daughter loves them. 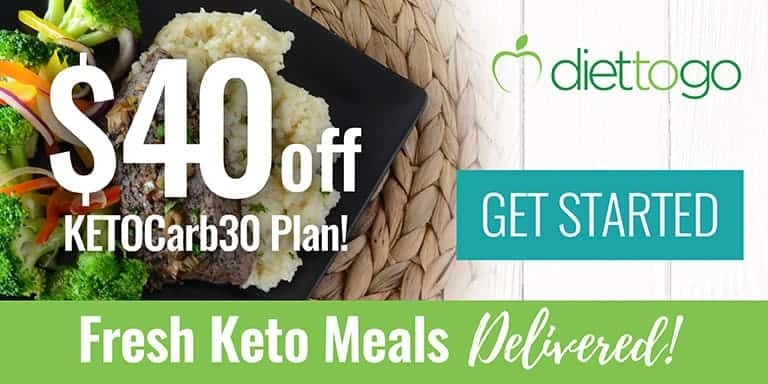 There’s so many low carb recipes to choose from, I always have a hard time picking out just a few to serve for celebrations. And, there’s quite a few that have gotten lost on the site like my Paleo Salmon Chowder. 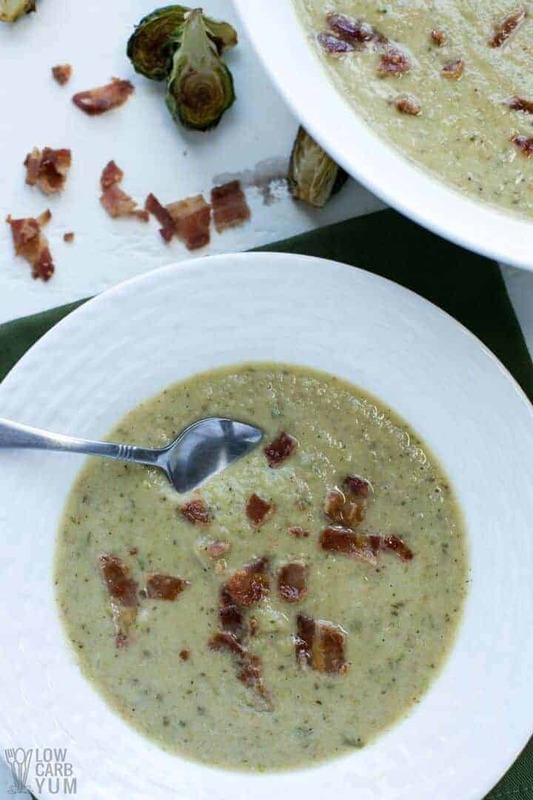 If you love Brussels sprouts as much as I do, I hope you give this easy low carb soup a try. 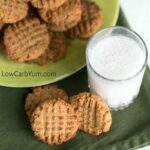 I’m definitely making at least a double batch the next time I cook it. 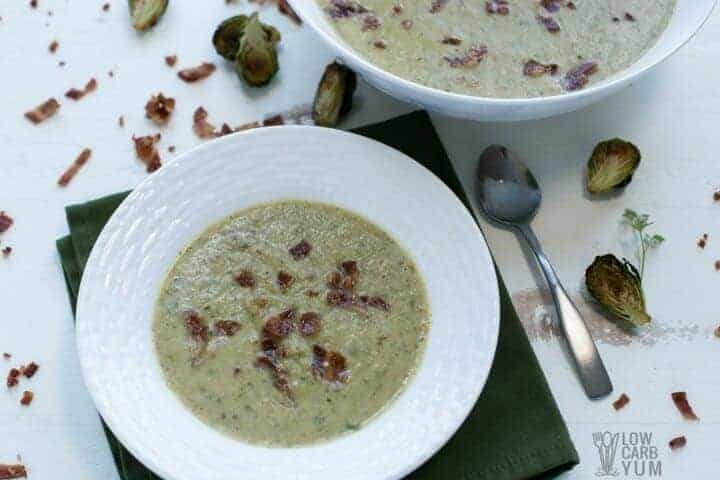 An easy roasted Brussels sprout soup with bacon is a comforting way to eat a serving of vegetables. 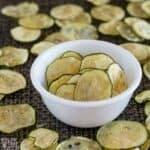 It makes a great appetizer or light lunch. Line rimmed baking sheet with foil. Slice Brussels sprouts in half. Place Brussels sprouts cut side down on foil and drizzle with olive oil. Bake at 425F for 25 minutes, flipping each after about 12 minutes. While the Brussels are baking, cook bacon in large pot or Dutch oven. Remove from pot when completely cooked and set on paper towels. Cook onions in bacon grease until translucent. Add the broth and salt. Allow to simmer for 5-10 minutes. 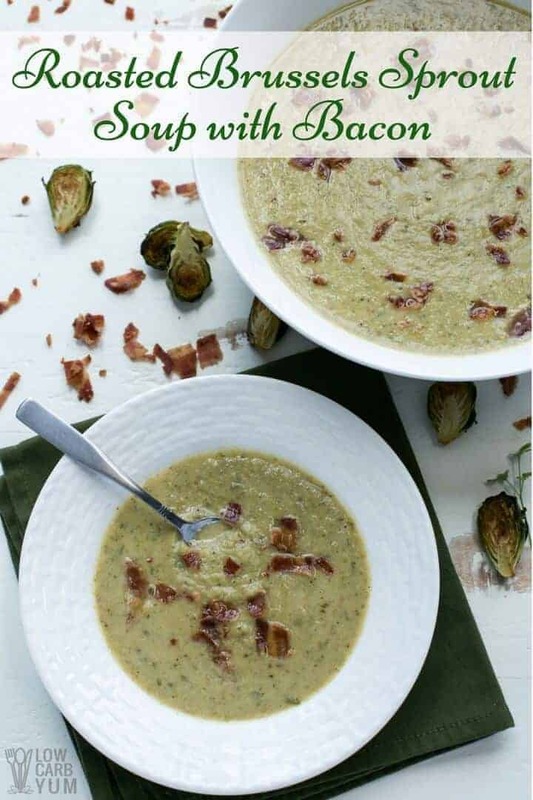 Chop bacon and add half to the soup along with the roasted Brussels sprouts. Allow to simmer another 5 minutes. 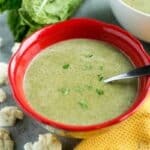 Using a stick blender or traditional blender, blend the soup until smooth. Serve with reserved bacon pieces sprinkled on top. It's not necessary to line the pan with foil. The step just makes cleanup easier. 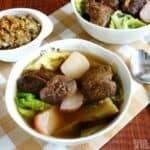 Do you think I could do the process in my instantpot? Maybe saute the sprouts in it then do the rest in the pot. Yes. 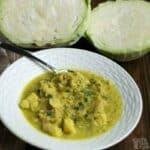 This recipe can definitely be made in an Instant Pot. I’d just use the soup setting. Love that spiced it up a bit with pepper and garlic. Sounds awesome. Very tasty soup. LOTS of roasted and bacon flavor. I’ll make again! Thanks for writing it to let let us know how the soup turned out! This looks yummy! 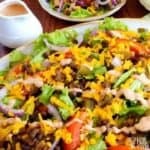 I’m gonna try and make this without the bacon since I don’t eat meat. But it might be a good way to eat Brussels sprouts without having to eat them whole haha! I find they taste best roasted or fried. But eating them pureed is a nice change. Nice recipe, btw very healthy and tasty too!